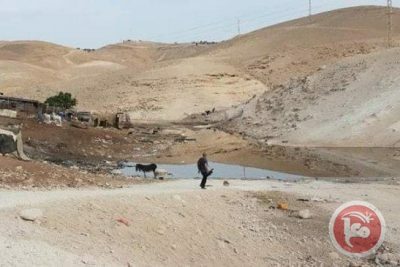 As Israel threatened to raid and demolish the Bedouin village of Khan al-Ahmar at any moment since the evacuation period ended, Israeli settlers stormed the village and flooded the area with wastewater, on Tuesday afternoon. Locals said that Israeli settlers from the nearby illegal Israeli settlement of Kfar Adummim stormed the village and were confronted by international and local activists along with residents of Khan al-Ahmar. Israeli settlers managed to flood the area with wastewater before activists and residents were able to stop them.